heinnews’s David Hein reached out to the minor league baseball world for a chat with Donald Lutz, a slugging first base/outfield talent in the Cincinnati Reds system who also plays for the German national team. Through May 12, the 23-year-old Lutz was hitting .311 with 10 homeruns, 30 RBIs and 5 stolen bases for the Reds’ High A Bakersfield Blaze. Hein and Lutz talked about Lutz’s background; playing for former greats such as Delino DeShields and Ken Griffey Sr.; homering off Mike Leake; watching speedster Billy Hamilton change the game; and the improving game of baseball in Germany. heinnews: For those who do not know, please give us your background. Born in the States correct? To an American father and German mother? How did you land in Germany and in Regensburg? Lutz: After I was born my parents got divorced and my mum moved back to Germany, and I lived in Friedberg (Hessen). I didn’t move to Regensburg until I was 16.
heinnews: You were late coming to baseball at 15 years, how have you been able to excel so quickly? Lutz: I just picked it up really quick. I had good coaches teaching me the game and everything just feels natural. heinnews: What goals did you have coming into spring training this year and what did you think of your spring training? 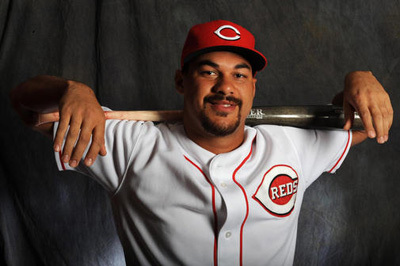 Lutz: I just wanted to leave a good impression with Dusty Baker and the Reds, and I think I did a good job doing that. It was my first big league camp so I learned a lot and it was so much fun. heinnews: You eventually got the assignment of moving up to High A Bakersfield. What were your thoughts on that? Lutz: Well I kind of knew they were gonna start me here because I’m still learning. But I think if I will be consistent I won’t be here all year. heinnews: What was it like for you to have Delino DeShields as a manager last season – someone who obviously knows so much about the game? Lutz: It was amazing. He knew so much about the game so whatever you needed help with he was able to help out. It doesn’t matter if it was a question about defense, hitting, the mental part of the game or whatever. heinnews: And then after two seasons with DeShields as a manager, now you get Ken Griffey Sr. What’s that been like? Lutz: Griffey Sr. is awesome too. It’s just because they played the game for a long time, and they know what it’s like to be out there every day. So they really take care of us. heinnews: You have mainly played 1B in the minors but this year you are playing the outfield, left field to be precise. Are you now going to be an OF who occasionally plays 1B? Or what is your position status? How are you taking to the outfield? Lutz: Right now I’m just working on both. We are trying to split the time so I get about the same amount of time in the OF as at 1B. I wanna be able to be good at both positions because it’s a plus. heinnews: What have the Reds told you to work on most? Lutz: They told me to keep working at my defense and staying consistent at the plate. heinnews: Before you went to Bakersfield you had the Reds’ Future Game where you hit a home run off Mike Leake at the Great American Ball Park. Where does that moment rank in your career thus far? Lutz: I would say that this was my highlight so far. heinnews: What have been some of the highlights and lowlights thus far in your young career? Lutz: Hmm, I hit for the cycle twice already. Last year’s cycle I went homerun triple double then single and all in 5 innings. I hit my first grand slam last year and I hit a bomb to tie the game in the 8th, then hit a walk off bomb in the 10th inning. 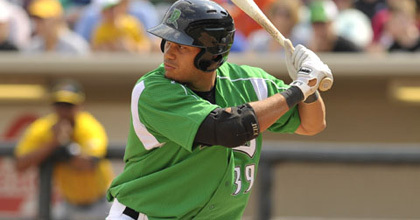 heinnews: This is your fourth season playing alongside Billy Hamilton. Thoughts on him and have you ever seen anyone faster? Lutz: No, he is the fastest guy I have ever seen. It is just amazing. They say he will change the game because he is so fast. heinnews: When you watch him, doesn’t it make you want to try to steal some more bases? Lutz: Yeah it does because he makes it look so easy. heinnews: There are some great players at High-A, anyone you really looking forward to playing against or facing on the mound? Lutz: No, not really. I usually don’t look who we play or who is pitching. I just try to go out there and ball. heinnews: Toughest pitcher you’ve faced thus far in your career? Lutz: Hmm, I would say (Aroldis) Chapman. heinnews: What are your goals for this season? Lutz: I wanna hit .300 again, make the All-Star Game, then be moved up to AA. heinnews: You have been receiving a lot of press over the past few months, what are your thoughts on that? Lutz: I like the press. I like to spread the word about German baseball because not a lot of people know there is baseball played in Germany. heinnews: How much would it mean to German baseball if a German were to reach the Major Leagues? Lutz: I think it would mean a lot. Maybe open some eyes to show people there is talent out there and there hasn’t been one yet so it’s about time. heinnews: I would like to ask a couple questions about German baseball. What were your thoughts on hearing that Regensburg will be hosting a World Baseball Classic qualifying tournament in September? Lutz: Oh man, I couldn’t believe it. Regensburg does a great job about marketing the tournaments and everything around it. So I hope there will be a lot of people out there. heinnews: Germany were drawn to play against Canada, Great Britain and Czech Republic. What do you think about Germany’s chances? And maybe say something about each team. Lutz: Great Britain and Czech Republic would be the easier two but Canada is a pretty good team so they are definitely the guys to beat. heinnews: Of course Reds 1B Joey Votto plays for Canada, have you mentioned the WBC qualifiers to him at all? If so, what was his reaction? Lutz: No, I havn’t talked to Votto about the WBC. heinnews: You played in October 2011 for Germany at the Baseball World Cup in Panama. You had a strong tournament individually – .368 avg, .478 OBP, 3 runs, 2 home run, 6 RBI. Despite the disappointing results, what was that experience like? Lutz: Panama was fun. It was good to play with all my friends from back home and my brother (Sascha) as well. I like representing Germany on the field. Too bad the results weren’t there though. heinnews: German baseball fans will see the 0-7 record and think you guys got smoked. But you lost 5-4 to Nicaragua, brought South Korea to extra innings and were close with Cuba for a while. With the Twins’ Germans and Kai Gronauer and now Daniel Thieben among others now in the minor leagues, what’s the state of German baseball at the moment? Lutz: Improving. We have more young talent coming up which is important so we are getting better and better from year to year. And I know the 0- 7 looks bad, but we put up a good fight and played really good baseball.